What is a character modeler? Give form to your imagination! From charming heroes to hideous beasts, video games are populated with all kinds of characters with unique weapons and equipment. Character modeling artists shape these characters and establish how they look and feel. As a character modeler, you’ll create the faces of our games – literally and figuratively – and in doing so, establish the most direct source of emotional impact and player investment. 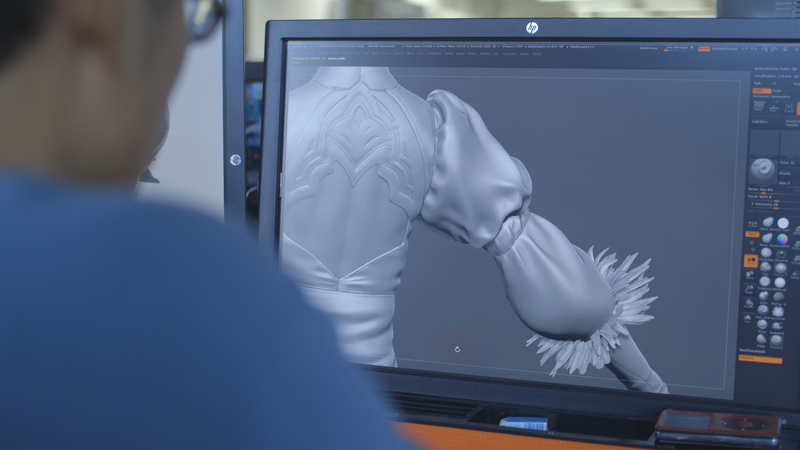 Our character modelers begin with designs from our concept artists and use digital content creation software to bring them into the third dimension. They add and weight joints to determine how characters can move – creating the perfect canvas for our animators. A model without textures is a blank slate. Our character modelers use Photoshop to create the textures that determine characters’ visual appearances. Whether working from photographs or starting from scratch, character artists get their textures just right, then apply them to models in Maya to make sure everything fits together nicely. They also apply shaders to put those finishing touches on the look and feel of a character. 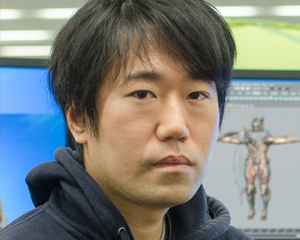 At PlatinumGames, we create normal map textures with ZBrush or similar software. After texturing, character modelers test their models out in-game to see how they’ll look. Once the game’s director and designers have given the character their OK, our programmers add them to the game. Animators and VFX artists are notified of the new character and get to work to bring them to life. At last, the character is home in the game, ready to be fine-tuned until they’re Platinum perfect. Concept artists create most of the designs for major characters, but our character modelers themselves contribute additional design elements as they model minor characters, ensuring that every character in our games is complete and interesting. Let’s say there’s a large bridge in the background that looks like it could move, to provide a perfect opportunity for the player to interact with the world around them. Our character modelers work with data from our environment artists to make the scenery itself as lifelike and active as their characters. Many characters require special treatment for parts of their bodies or clothing that hang downwards – draping robes, loose chains, etc. In the simplest cases, programmers can handle this on their own, but more complex characters need special handling to work effectively with the latest cloth physics tools. Our character modelers ensure that all parts of their characters are expressive and of high quality. I worked as a character modeler for video games before coming to Platinum, and I was hungry for a chance to push my skills to a higher level. Just as I was thinking about how to move my career forward, a friend of mine told me about PlatinumGames, so I applied. What’s the atmosphere like at PlatinumGames? When I first arrived, I noticed that in a lot of ways, the atmosphere at Platinum feels more “free” than other places I’ve worked. I still feel that way today, not least because PlatinumGames is a company where anyone can make their opinion heard, regardless of office hierarchy. Everyone has a very strong personal relationship as well. When I’m able to make people happy! This isn’t a job you do for yourself – you do it because you want people to play with the things you’ve created. When players enjoy your work, that’s the biggest payoff of all. I also really enjoy it when I know I’ve managed to convey a character’s unique personality, and create parts that suit them perfectly. What ‘s the appeal of PlatinumGames for you? As I said before, anyone here can make their opinions heard, regardless of their position. PlatinumGames also offers a lot of chances for advancement – motivated employees are often given new opportunities they might not expect elsewhere. What are your personal goals as a character modeler? Modeling tools are constantly evolving, and of course I hope to keep up with their progress. Along with that, though, I strive to master the tools I’m already using to make even better-looking characters. Seeing other artists’ tremendous work gets me pumped up; I hope I can create something that gives similar feelings to other artists. I’m always happy to work with people who’re eager to push themselves and their teams. Iron sharpens iron! Let’s make something new together.